The boom in Dropcam-inspired Wi-Fi security cameras has fostered a lot of diversity in design and features. But one thing hasn’t varied much in this swelling category: Prices, which hover between $150 and $200 for most models. Now Ezviz, manufacturer of sophisticated multiple-camera security systems, has stepped into this arena with a more affordable option, the $70 Ezviz Mini. Though it’s marketed more as a tool to monitor children, pets, and the daily goings-on at home, it is no mere Dropcam lite. This diminutive Wi-Fi camera offers many of the same security features of its bigger competitors—including motion detection, night vision, and HD video—at less than half the price. The Ezviz Mini is 3.5 inches tall and weighs in at slightly less than four ounces. But don’t let the small size fool you; the camera’s metal housing and stand feel sturdier than many of its full-sized competitors. The camera’s base is magnetic and it also comes with a mounting bracket, giving you a variety of placement options. 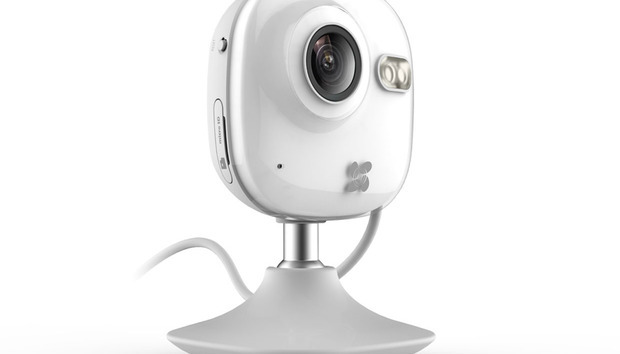 The Ezviz Mini has a 115-degree viewing angle and streams live video in up to 720p HD. Its night-vision feature—actually, an infrared LED—activates in low-light environments and can illuminate up to 30 feet in total darkness. The EZVIZ Mini has a magnetic base and can also be mounted to wall. While the camera gives you a continuous live feed, it will start recording when it detects motion within its field of view and then push an alert to your smartphone via the free Ezviz app for Android or iOS devices. Though the Mini has a built-in microphone and records sound, the Mini does not support two-way audio or sound detection (unlike many other cameras in this class, if not this price range). The last feature can be an important security feature for times when activity may be happening off-camera. The Ezviz Mini records simultaneously to its 16GB microSD card and to the cloud (the latter requires a subscription), and that’s good news if you’re using it for security purposes. Most Wi-Fi security cameras provide one option or the other, but the Mini’s dual recording method means you have a backup copy of any surveillance footage in the event of an Internet outage or if a burglar steals the camera. Video is encrypted directly on the camera, while streaming is secured by SSL. Up to a 64GB microSD card can be used for onboard video storage. Normally, the Ezviz Mini comes with a 7-day trial cloud storage subscription, but for a limited time Ezviz is extending that to a full year. The trial starts when you activate cloud storage on your app, and you can view the last week’s worth of video. At the end of the trial period, you’ll be given the option to subscribe. Plans range from $5 per month/$50 per year for 7 days of storage to $10 per month/$100 per year for 30 days. Setting up the Ezviz should be simple, but in reality it was a little quirky. After registering through the app you’re supposed to scan a QR code—either the one on the bottom of the camera or the one affixed to the Quick Start brochure—enter your Wi-Fi details, and be up and running. I couldn’t get the Ezviz app to recognize either QR code, however, and after several minutes of trying I opted to manually enter the camera’s serial number to get things going. The Ezviz Mini’s tiny dimensions make it easy to nestle in tight, inconspicuous spots, which can reduce the Big Brother feeling of being monitored. Video is crisp in both day and night mode, but there is some image bending at the edges. You can view video in portrait or landscape mode, or, if you have other Minis installed around the house, as part of a four-camera multi-view to give you comprehensive home monitoring. Motion detection is hit-or-miss with even the best Wi-Fi security cameras. Depending on the detection algorithm and the sensitivity of the sensor, you may get too many or too few alerts. The former leads to lots of false alarms when the camera picks up incidental movement like the fluttering of a curtain; the latter could mean you’re not notified of a legitimate security event. That’s why many cameras mitigate this with fine-tuning tools that allow you to define detection areas, adjust the frequency at which you receive notifications, or otherwise calibrate this feature. The Ezviz Mini’s motion detection is definitely on the sensitive side. At one point I was getting alerts every couple of minutes, but often when I viewed the video of the triggering event, there would be no discernible motion. Unfortunately, the Ezviz app doesn’t offer much recourse for reducing these false alerts. You can try—as I did, successfully—moving the camera to another position in the room. If that doesn’t work your only option is to turn off notifications altogether and just keep an eye on your live security feed. The minimalist EZVIZ app lets you connect up to four EZVIZ Mini cameras for comprehensive home coverage. The Ezviz app, which controls all the Ezviz Mini’s functions, is incredibly clean. It’s not very intuitive, though. There’s little to indicate what features are available or how to use them. Through trial and error, I figured out that tapping the video image on the home screen opens a video feed page with most of the camera’s controls. Beneath the video window—where you can view up to four camera feeds simultaneously—is a toolbar from which you can turn the camera on and off, mute audio, select single or multiple camera feeds, and zoom up to 8x on the image (this is a software zoom, not a true zoom lens). Beneath this are icons for taking a screenshot of the video, manually activating recording, and selecting the resolution (Basic, Standard, or Hi Def). As mentioned before, the Ezviz is slim on customization options, but most of the basic ones are available in the settings menu, including toggle switches for image encryption, notifications, and night vision. It does have a scheduling feature, which enables and disables notifications at times you specify. This is useful if you want to, for example, only be notified when your kids get home from school. If you can get over the hurdle of its overzealous motion detection, the Ezviz Mini is solid, no-hassle people-and-pet monitor and basic home security camera. And while the Ezviz app lacks polish, it’s got a short learning curve and makes operating the camera fairly easy. It would be nice to see a few more robust security features such as sound detection and a battery back up, but that seems like a minor quibble when the price is so right.